Psychosocial well-being increases with higher school environment support, and social competency building efforts in classroom. Pro-social orientation increases with higher peer support. Depression decreases with higher teacher and peer support, and broader school environment support. Delinquency decreases with school environment support (that includes healthy boundaries). Commitment to Learning & School increases with school environment support, and social competency building efforts in classroom. Overall examination grades are not overly impacted by school supports, but is influenced somewhat by peer support. ​1.Operationalizing key components of adolescent psychosocial functioning. 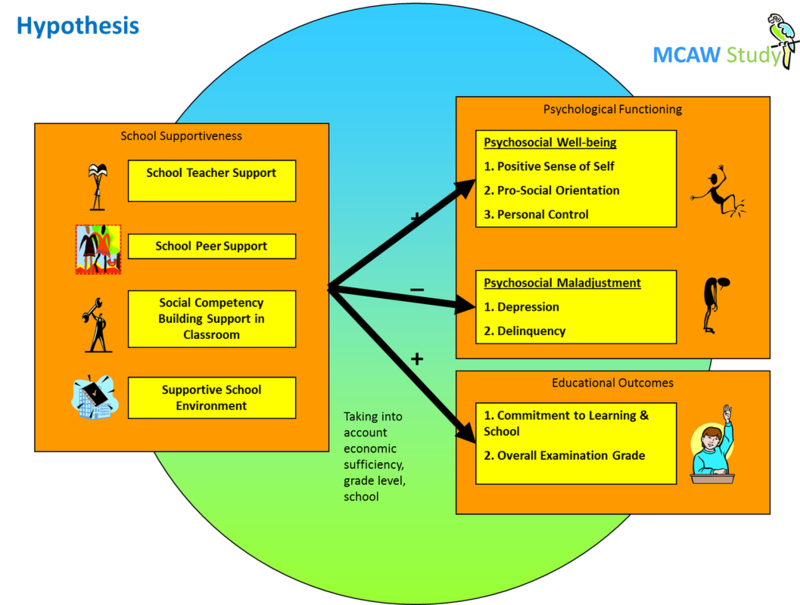 1.1 MCAW shows a way of assessing 3 markers of psychosocial well-being that map onto established conceptual frameworks. It provides us with markers of positive adolescent functioning in their social environment that work for both genders. 1.2 MCAW shows the importance of keeping psychosocial well-being and psychosocial distress separate. Including both in our holistic assessment of adolescents has the potential in identifying and focusing resources on adolescents in greater need for intervention. 2. Understanding and using the natural school environment. MCAW points towards the great potential schools have in influencing adolescent functioning, both for adolescents at higher risk, and for normal functioning adolescents. Building on existing school supports has potential in increasing psychosocial well-being and reducing psychosocial distress. Likely increases in educational outcomes can also be expected.